Recently, I made a recipe from the Kitchen Prescription called “Copycat J Alexander’s NYO (not your ordinary) Mac n’ Cheese” that was delicious. I am not actually a huge fan of Mac n’ Cheese, but the one at J. Alexander’s restaurant in Tennessee has changed my opinion. My friend Renee Crosse sent me the link to the Kitchen Prescription after we indulged in an order from J. Alexanders. I made a few tweaks to their recipe to simplify it using the ingredients that were readily available and worked for me. Don’t be intimidated by the length of this recipe — the resulting Mac n’ Cheese is worth the effort! Bring 6 cups chicken stock to rolling boil in medium saucepan. Add pasta and cook 6 to 8 minutes. Drain noodles and put them back into the medium sauce pan, toss noodles with olive oil and lemon juice. Melt 2 of your 4 tablespoons of butter in large saucepan over medium to low heat. Continue cooking while whisking for 3 minutes. Gradually whisk in heavy cream, milk and sour cream. Pour over Panko and gently stir or toss. Add sautéed onions and garlic to melted cheese mixture. Stir in Sugar and Tabasco sauce. Simmer mixture on low heat while occasionally stirring for 15 minutes. Add half of the gruyere and parmesan cheese and continue simmering on low heat. 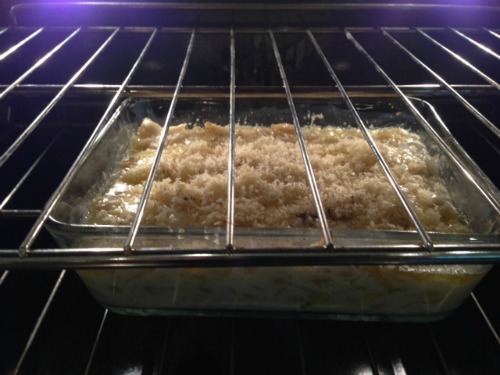 Grease a 10-12 cup baking dish with butter. Pour half of the noodle mixture into the baking dish. Sprinkle with the ½ of the remaining gruyere and parmesan cheese. Pour in the other half of the noodle mixture. Top with the remaining gruyere and parmesan cheese. Sprinkle buttered panko over top. Bake at 350 degrees F or until panko is lightly browned, about 20-25 minutes.